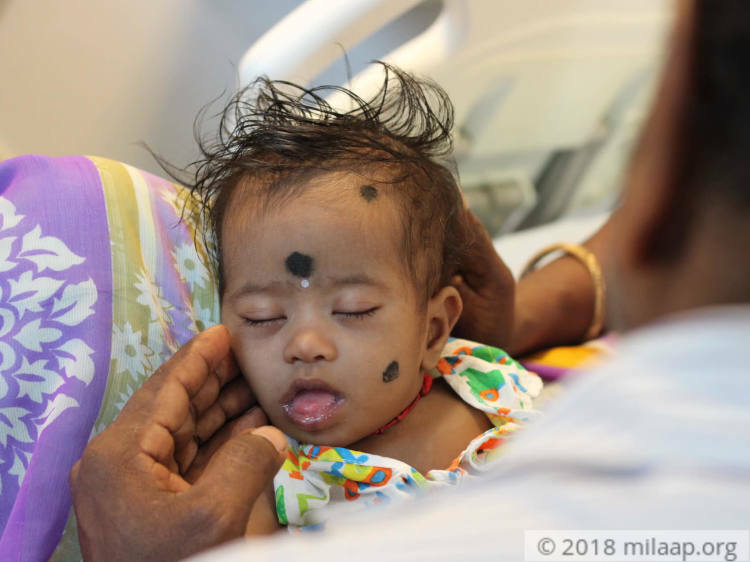 “The very first time she suckled for milk, she could drink only for a few minutes because she was running out of breath. But when I noticed that she was becoming blue, I screamed because I had not seen anything like that before.”-Vasanthi, mother. 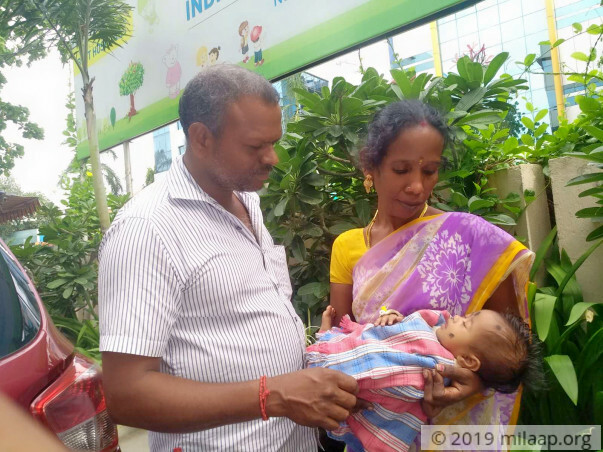 Vasanthi and Subramanian have been married for four years now and welcomed their first child, a baby girl they named Suganya only three months back. 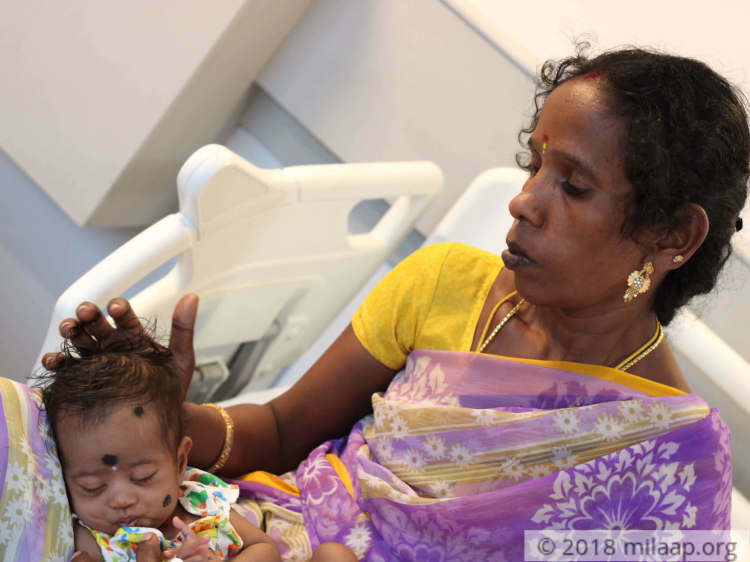 Vasanthi did not have any problems during pregnancy and was shocked to see that her baby girl was struggling to breathe as a newborn itself. “She would always cry and whenever I tried to feed she would turn away or suckle only a little. I could see that she was very hungry, but she was never able to feed properly. We never knew what the issue was at first.”-Vasanthi. 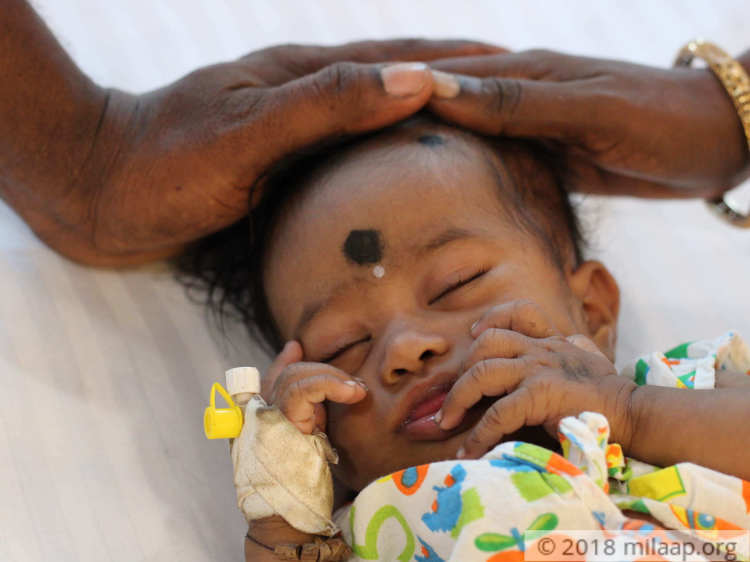 Not long after her birth, her parents took her to a hospital in Chennai from their hometown of Thirukkuvalai in Tamil Nadu. She was found to have a very serious heart condition. There is an abnormal fusion within the walls of her heart that leads to the mixing of oxygen-rich and oxygen-poor blood. This puts excess pressure on the main artery to carry oxygen to the rest of the body. “We didn’t understand the technicalities of our baby’s problem, but the doctor clearly told us that our baby’s life is in danger. He said that only an urgent surgery can make her normal – we were shattered when he told us this.”-Subramanian. Vasanthi has seen her child spend sleepless nights because of breathlessness. As a mother, it has affected her so much that even she cannot sleep peacefully nowadays. “Suganya makes a whirring sound when she sleeps and wakes up in the middle of the night. She is also severely underweight because she does not feed properly. 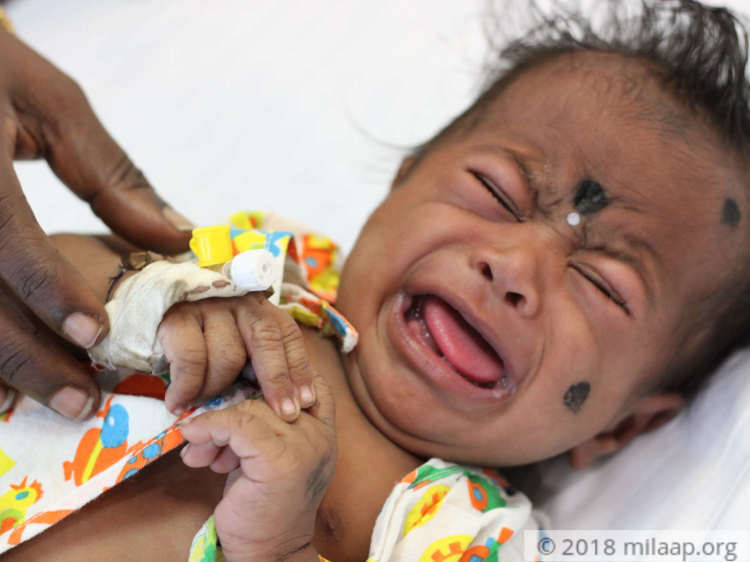 How long will my child suffer like this?”-Vasanthi. “I am a daily wager who makes less than Rs 9.000 a month when work is available. When no work is available, I have nothing in my pocket. I borrowed Rs 5,000 from my friends just to fund the trip to Chennai. I believed that medicines would make her alright; never expected that she would need such an expensive surgery. I don’t know how I will make so much money on time to save my baby.”-Subramanian. Baby Suganya is running out of breath while you are reading this. Her heart may fail and she may even die without an urgent surgery to fix her heart defects. Her parents are struggling to arrange the money on time. They are very poor people who need your help to save her. Thank you for the love and support you have shown towards Suganya. Here is a quick update on her health. Currently, she is at home and doing fine. Doctors have advised that they can proceed with the surgery once the baby has gained weight. They have prescribed medicines and has asked them to visit the hospital after one month. 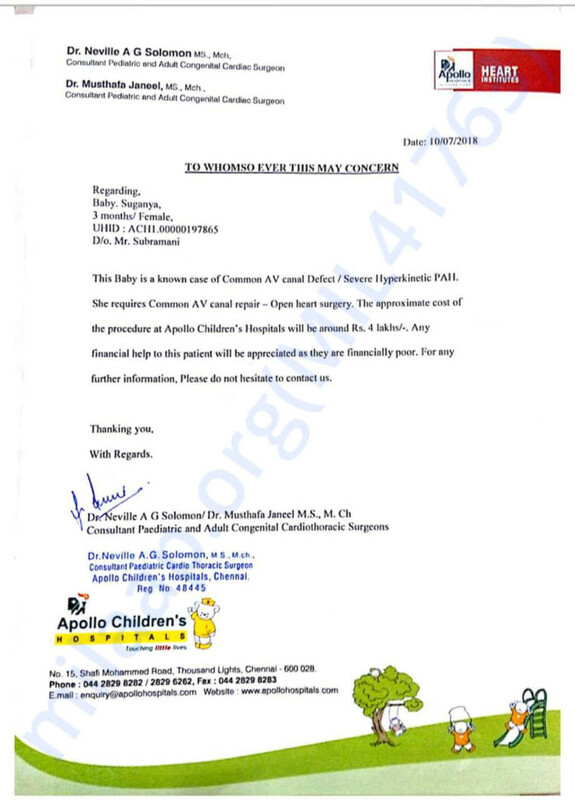 Hopefully, the baby gains weight so that surgery could be performed at the earliest.